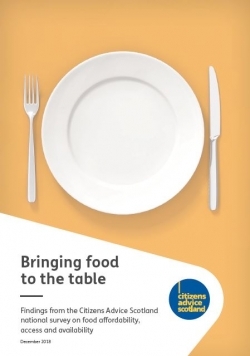 The Citizens Advice Network sought to better understand the day-to-day realities that people in Scotland face when bringing food to the table. In order to achieve this, a survey was launched via both Citizens Advice Bureaux and media platforms (social and traditional). Ultimately, over 2,650 people living in Scotland took the time to complete the survey. One-third of respondents (33%) were aged 45 to 59 years, while 6% were below the age of 25 years. Over half of respondents (53%) travelled to stores using their own car, while 20% walked. More than one-fifth of respondents (21%) had gone for a whole day without eating because they did not have enough money for food. Over one-quarter of respondents in employment (29%) had cut down the size of meals, or skipped meals, because there wasn’t enough money for food they needed.